Apricots...yum! What a treat to harvest apricot fruits in mid summer. They ripen about the same time as peaches (100 to 120 days from bloom). Prunus armeniaca or Apricot blooms in early spring. The fruit is a drupe and like plums has a thin outer downy skin surrounding the yellow flesh. You will definitely want to plant your trees in protected areas of your yard or orchard to safeguard from late spring frosts and freezes. As they grow in full sun to part shade, Apricot trees are adaptable to light settings. 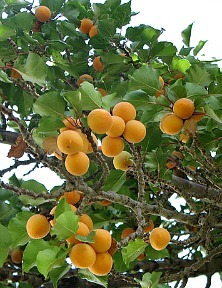 Most Apricots are self-fruitful or self pollinating. Growing approximately 15 to 20 feet tall, they can spread up to 15 feet wide. In an orchard setting, space trees every 15 to 20 feet. Apricot trees prefer loamy soils in the pH range 6.5 to 7.5. As with all fruiting plants, you will want to be certain to water your Apricot trees regularly when they are in bloom and during their fruiting periods. Fertilize in spring after the plant leafs out and then at about 1/4 of that monthly to young plants. Detailed information on growing Apricot Trees. Please Note: The only edible part of the Prunus armeniaca is the fruit itself. The remaining parts of the tree, bark, leaves, seed, are all poisonous. There are so many ways to eat Apricot fruits...and they're so delicious! Food and Wine Online offers some amazing recipes for Apricots for Apricot Butter, Apricot Jam, Tart, Dumplings, Apricot Sour Cocktail and many more mouth watering Apricot dishes, you'll delight in preparing with Apricots from your own garden. Right after harvest, you will want to prune or thin out your Apricot tree branches to allow light through for next year's crop. As they bloom early in the season, they will not have time to produce new growth in spring for flowering and will flower on the new growth put on immediately after harvesting. So prune immediately after harvesting to allow for new growth and buds to set. Apricot tree leaves have a golden orange color during fall foliage. Apricot (Prunus Armeniaca) trees ship in Fall (November) and Spring (April). Plants are 2 to 3 feet tall bare root field grown plants.